And look what i found last night wee! Look what i found this morning! Are they everywhere in Florida? 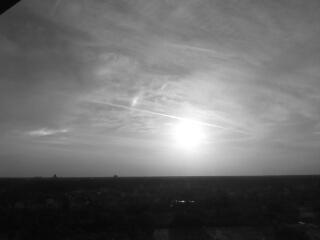 There are cirrus clouds in the sky today, I may be able to see another one tonight! I want to apologize for not having the wallets sent out yet to the winners. I should have time to work on it this weekend! Here it is in Black and White! 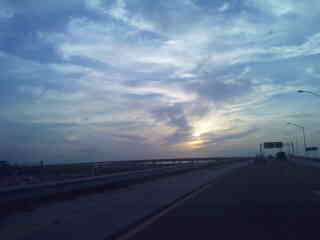 Can you see the Sun Dog to the left? Here it is on the right side! 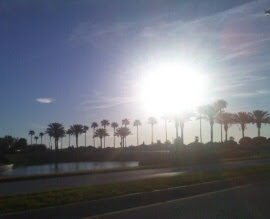 This was taken outside of The Wyndham Palace at Disney. Epcot's Ball is toward the bottom left. It is the hump along the land line. My family and my sister Cindy's family stayed here for a day while she was in town. It was a very good weekend and some sister time as well!! Barry gets the prize for seeing this sun dog! It started on the right side of the sun and then ended on the left side. 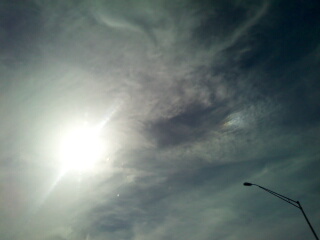 The kids were excited about the sun dog. It lasted over 10 min. Thank you Barry for bringing it to our attention. It was an unforgettable experience for the kids! Yeah!! It is here. Grapes of Wrath!!! The picture doesn't do the beautiful purples justice. Thanks Jess!! 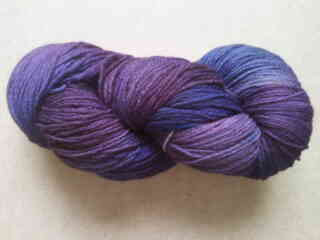 I got this beautiful skein from Storied Yarn this is her blog. Here is her Etsy site. She does color ways of books and characters. I just love them because I feel as if the yarn is telling a story. I know I should be finishing up another project, but I had to see how the colors look. 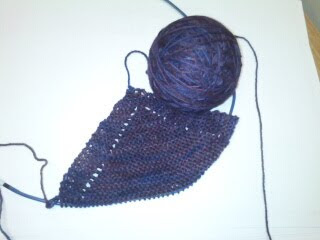 This is going to be a basic Triangle Garter Stitch Shawl. I love it. The yarn is very soft as well. Thanks Jess!! 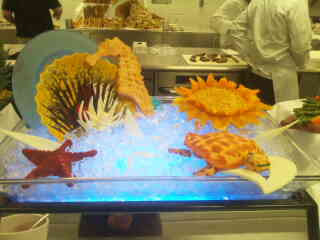 Well, if anyone lives near a Culinary School you should check and see if they do a buffet at some point during the year. 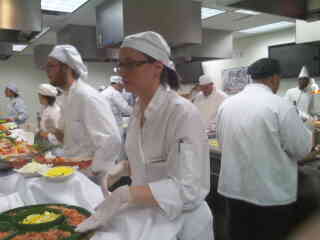 At Valencia's culinary school their final exam was this wonderful feast!! My wonderful friend Jill is one of the amazing students that attend this school. The food was amazing!!! I am not bias, but Jill's Tourane (I probably spelled Tourane wrong) was the best!! All of the food was super yummy!! Then they had a dessert room!!!! This is another friend of mine (coincidentally) Janine. Yes I have two friends that just so happen to be attending this school. I kept asking Janine if she met Jill yet and I asked Jill if she met Janine yet. After about a year they finally met. 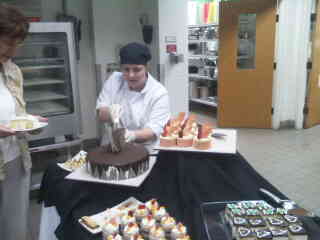 She is in the Pastry Dept. I was in sugar heaven!!! Words cannot describe all the amazing foods I tried that day. Thanks Jill for inviting me and my Dad into your world of Culinary School. If you need to practice and need extra taste buds, I am here for you sister!!! 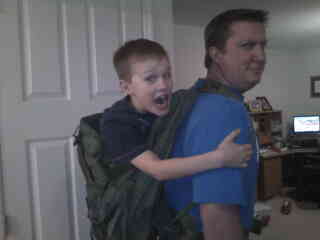 So my wonderful Hubby bought some backpacks. They were huge!! So I was trying to figure out what we could possible put into these bags and how heavy could we pack them. 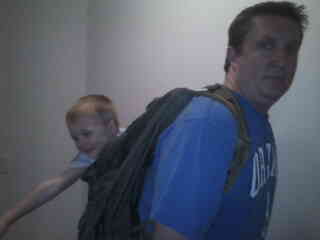 Well as you can see.... these packs will hold children. Only problem now is they want to ride in them every night now. Hmmm maybe I can make a new exercise video and become rich and infamous. Wow, I can't believe that I've seen 3 rainbows in one week. Can you see the double rainbow here? As I drove home you could see the end of the rainbow in the bushes. 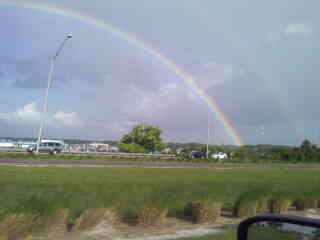 My son Austin said I was driving to fast and to slow down so that we could find the pot of gold. It looked like you could reach out and touch it. This picture was taken Wed. and the bottom picture was taken Thurs. I can't wait to see what the sky has to offer today. There are some clouds out...we will see! 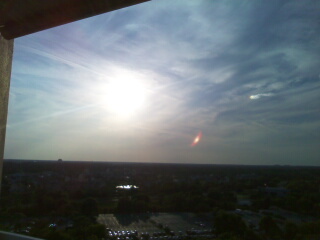 You maybe able to see a tiny glimpse of a sun dog here. To the left. It didn't last long. The sky lately has been just beautiful. 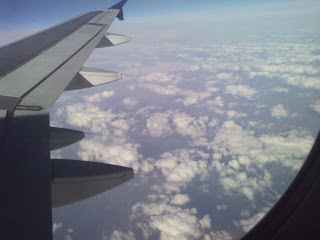 I wish I could spin the clouds into yarn and knit me up a sky blanket! 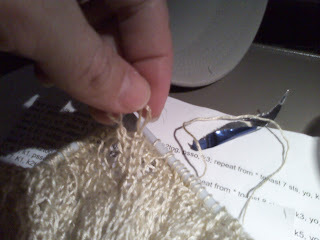 My Knitting Foible is Fixed! The first picture is what it is suppose to look like. The second picture is where you can see my foible. As some would say it is my enhancement. Oh I forgot to tell you I also lost my pattern so on top of it all i had to get another copy of it and figure out what row I was on. Mercy!! 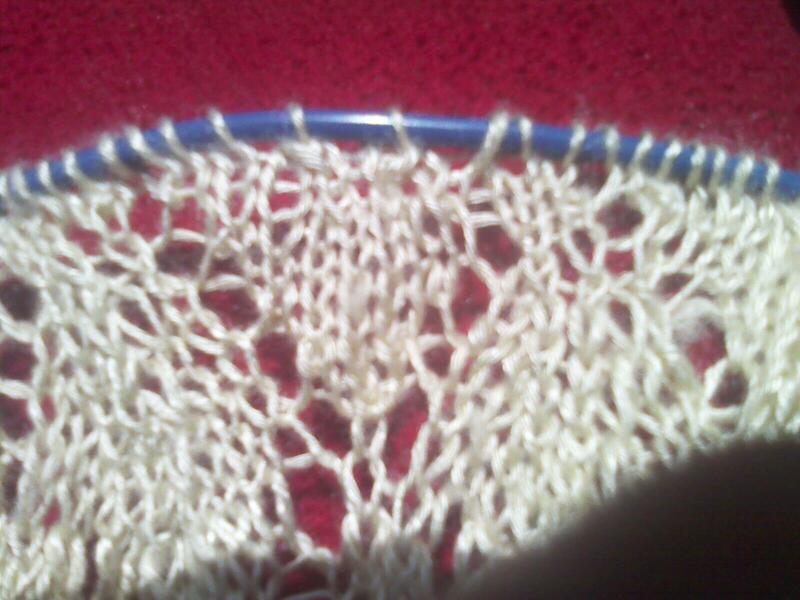 Well I have done a few more rows and I must say the mistake is hardly noticeable. I want to thank Barry for holding my hand as I cried trying to figure this out. 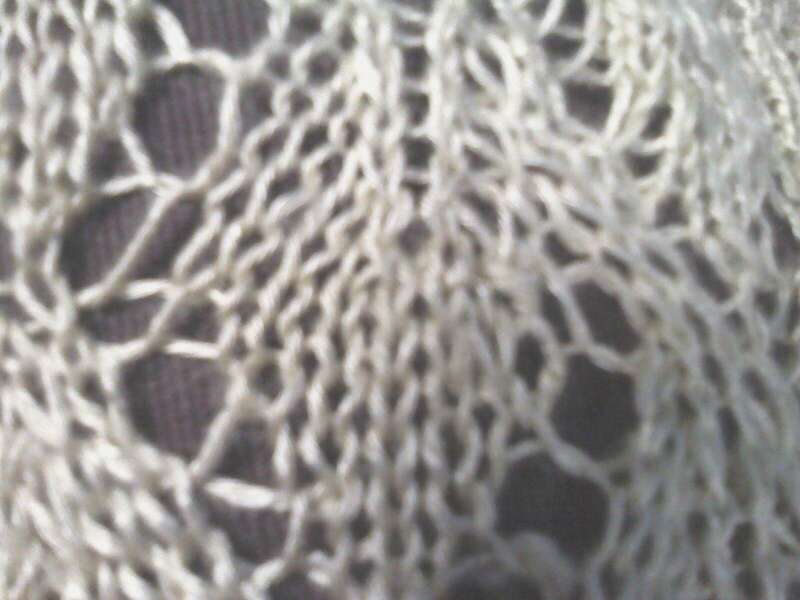 I am glad I moved some stitches around and put the right amount on and that it didn't affect the pattern. Thanks Barry for really being there for me. (and for not laughing at me) No more knitting lace in the dark with a tiny light on for me. Cumberland Falls was beautiful. 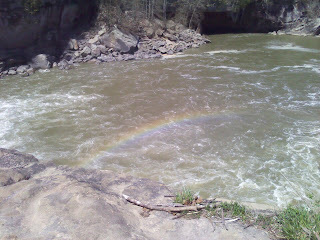 I was able to get a picture of a rainbow from the water splashing into the air and the sun hitting it just right. You can see a moonbow during full moons there. Too bad there isn't a full moon or we would stay to try and see it. Enjoy the view. A vacation is not a vacation for the Wagner's unless you go into a cave. 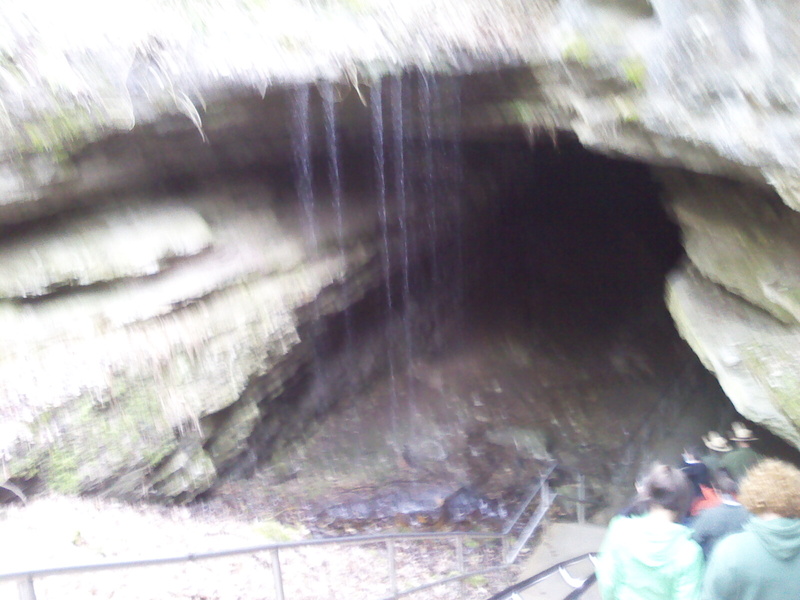 We went to Mammoth Cave. It is the Mother of all caves. We also drove down a road that ends i water, to drove onto a boat to get across. I am freaking out. I dropped 2 stitches in my lace knitting I almost cried but I didn't want the guy next to me on the plane to think I was crazy. I don't know what to do. 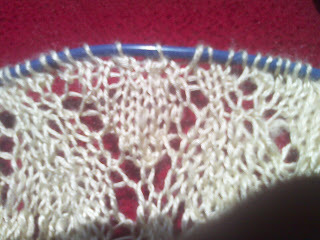 I put the stitches back on but I don't know if the right amount of stitches is right. HELP. I'm on my way to kentucky! I am so glad that i can knit on the flight. 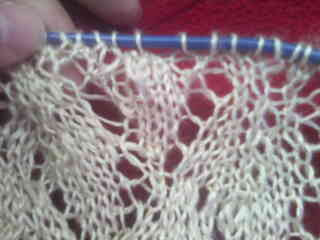 I've got to get this shawl done !! Thanks dad for taking me to the airport. Yes, I've been knitting about 2 hours every night to try and get this knitting project finished. I had no idea lace knitting took so long to do. Yuck!! I must try larger needles!!! Anyway, this project is for someone special, so I am only showing a tiny portion of the item. I only have 30 more inches to go. Alright, Sometimes designers should quit their day jobs. 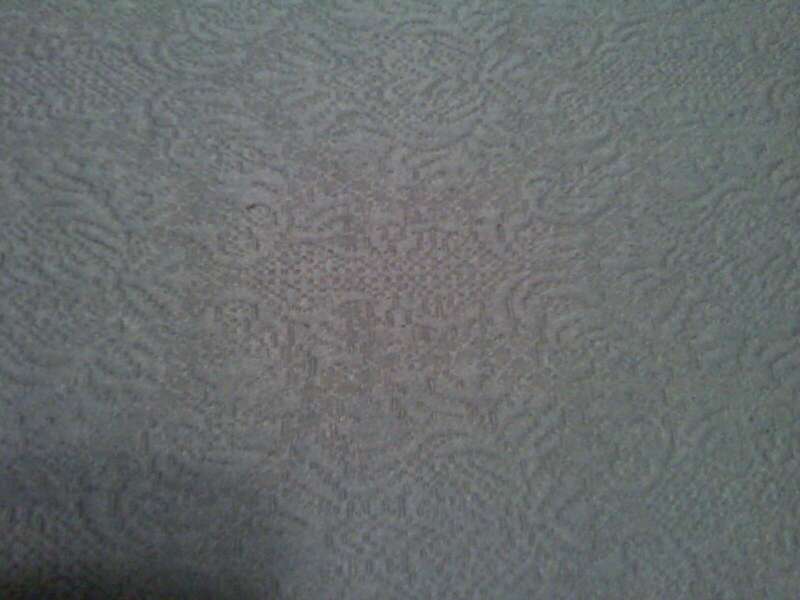 I mean seriously whoever wove this fabric..... Ummm it is non-appealing. This is a cushion for the booth for a table that we bought. 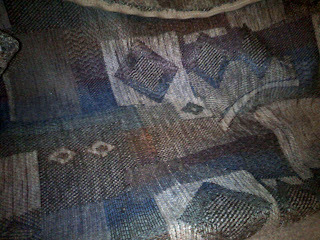 Well as you can imagine I couldn't put up with this, so I decided to get rid of this fabric and make a new cushion cover. I know this isn't a very good picture, it was taken at night. The light in my house is better during the day. It may look like these cushions were easy to make, but I was longing for a box store that already had cushion covers that were pre-made. It was a pain!!! But, The finished product sure looks professional. I don't mean to brag, but it does look better than what it did before. Once I figured out how to sew this cover I was on my way. It didn't take that long to sew up. It was just the initial figuring out that took many hours. 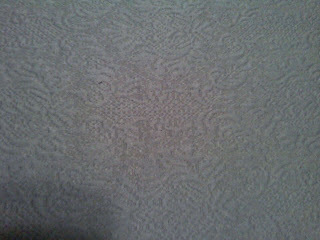 Here is the close up of the fabric. It is almost a quilted fabric with textured stitching. I like it better than the original fabric. 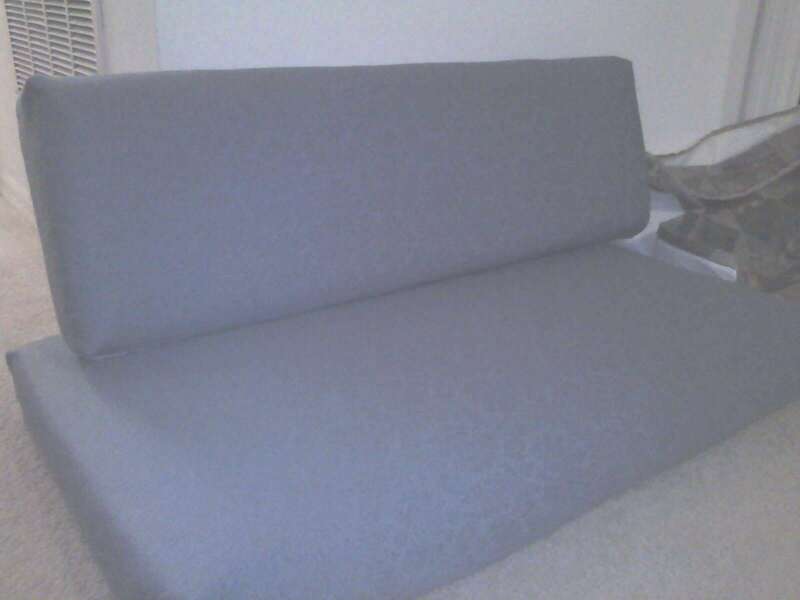 I've only got 2 more cushions, and 4 throw pillows to make. I may make place mats with the leftover fabric, I'll just have to wait and see if I bought enough fabric. 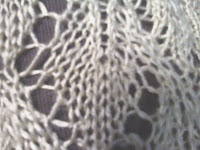 This sewing project was a nice change of pace, the lace knitting is going so slow that I was getting bored with it. The break was nice.